CimeXa's engineered silica composition achieves rapid control while remaining viable for up to ten years (when undisturbed). With its broad label usage, CimeXa Insecticide Dust is a comprehensive asset for pest elimination to service professionals, and is now available to residential users as well. CimeXa can be applied as a dust, like diatomaceous earth, or can be mixed with water and applied through a hand-pumped sprayer. Once applied, CimeXa can remain effective for up to 10 years as long as it’s left undisturbed. There’s no odor or staining, and it won’t absorb water vapor except in very high humidity conditions. Cimexa may be used as a liquid spray by combining 1 lb of the powder with 1 gallon of clean water. Apply approximately 1 quart of solution per 250 square feet of area to be treated. CimeXa is made up of a unique silica powder, which destroys the waxy cuticle of insects, causing rapid dehydration and death. CimeXa has been shown to kill bed bugs over three times faster than diatomaceous earth, and offers a better consistency as well. CimeXa can be applied as a dust, like diatomaceous earth, or can be mixed with water and applied as a spray. Once it's applied, CimeXa can remain effective for up to 10 years as long as it's left undisturbed. I'm not sure who carries it in your area, but we offer free shipping and can ship it to you quickly. Q: Huge spider infection in storage garage: countless nests, too. Will this destroy both live and eggs? No powder insecticide would be effective against eggs. 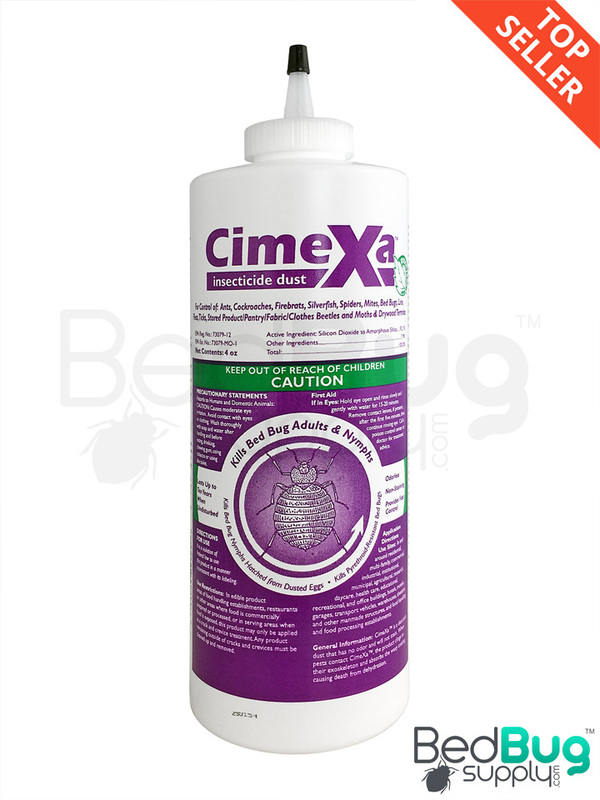 You would need to use CimeXa alongside a residual spray labeled for spider eggs. Q: Can this be used around pets? DE can safely be put on pets. Space can just be put on pets? All of our products are safe to use around pets, as long as you follow the instructions on their labels. However, none of our products should be applied directly on pets. That is not instructed, advised, or safe regardless of whether or not the product is natural, non-toxic, or anything else. Q: Is this product any less effective when mixed with water? I want it to cover a large area and thought it would be easier to apply that way, and potentially more discreet. CimeXa shouldn't be any less effective after being mixed with water, since it doesn't actually dissolve or "mix" at all. It's simply transported by the water and stays in place after the water evaporates. Q: Should this work on fleas as well? Yes, CimeXa is labeled for use against fleas. Make sure to follow the label instructions that specifically address flea treatments. Q: Can CimeXa be sprayed where I already put down diatamaceous earth? Technically yes, but it would be a bit redundant. CimeXa and diatomaceous earth are nearly identical in form and function. Q: I want to use Cimexa as a spray and am wondering where to put it in relation to Crossfire. 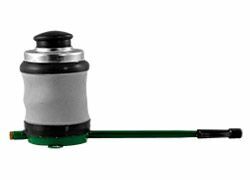 Can one be used on top of another, ie baseboards and edge of carpet, or should they be used in separate areas? Cimexa and Crossfire can both be used in the same areas. Each product's labels have instructions on application that need to be followed. Q: What respirator would you recommend using when applying this product? We have always used DE for years in our old house. We used to breed Canaries and they are extremely sensitive to any type of insecticide. This product works a lot faster than DE which is nice. I would recommend this product and company to anyone. Great service from the company and very helpful with all questions. Reviewed by: John Gorczyca from Lafayette, IN. 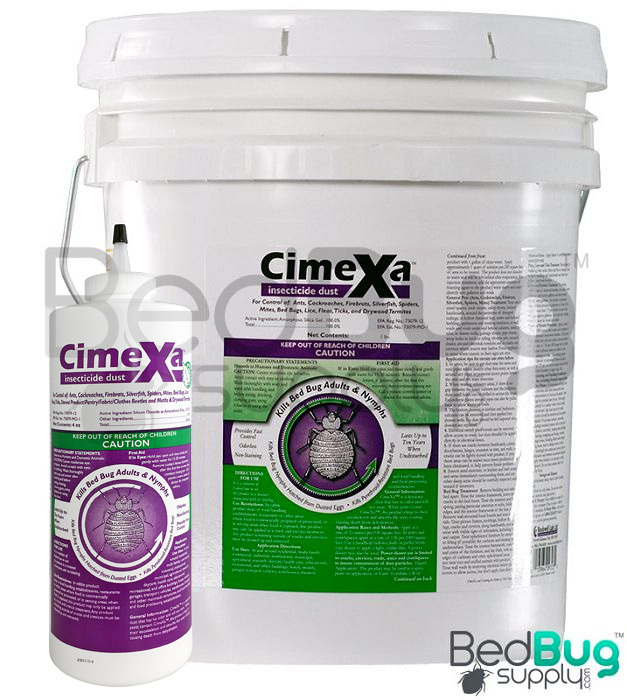 Cimexa is extremely effective in eliminating bed bugs and at a cheap price. 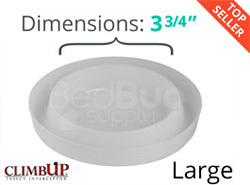 I actually bought some back in May from this site and used it to treat two bedrooms that had become infested (we also used the mattress covers). Within days I could no longer find living bugs in the rooms and to this day the rooms are clean. My only regret is that I didn't buy more of the product to treat the entire home. We found some more bed bugs in the living room on a piece of furniture that I suspect may have been our original infestation source - I used what little Cimexa I had left on the furniture and in the rest of the room but I think I may need another bottle to complete the job. Again, Cimexa works great, I just needed a little more of it. Reviewed by: Chris from Mesa AZ. Hands down the BEST bed bug treatment product on the market BAR NONE!!! The Cimexa bottles that I ordered had Cimexa residue all over the containers. Very dissatisfied. Reviewed by: Artemio from 1858 S. Allport St.. Received promptly and it works great. Also, had a conversation on Live Chat with Stacey and she answered all my questions and was very helpful. This website is a must to BOOKMARK! 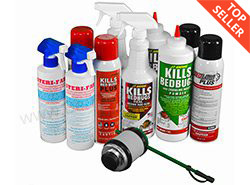 Great info and helpful in fighting off those bed bugs. Am working on my 30 days without seeing any. Fingers crossed!!! Reviewed by: anita schuster from . Reviewed by: cheema from miami. I used this product to apply along the baseboards of my home. Easy to use, hopeful of the results. Reviewed by: Carole from Baltimore. Reviewed by: joe golovich from pittsburgh pa. Received the product in a timely manner. Thanks! Reviewed by: John from Florida. Studied and searched for remedies to bed bug problem, learned DE does not kill them soley, Cimexa tests proved working alone it killed the bed bugs, as long as there is no disruption, took a couple weeks to actually not see any bugs but has done what it promised so far, about two weeks into my battle. Reviewed by: s j from Flagstaff, AZ.